Our students accomplish amazing things in the piano studio all the time! But often we breeze right past them. They conquer that B-major five-finger scale that’s been a struggle. Master hands together in a tricky passage. Finish a book, memorize a piece, students do awesome things! If we don’t stop to take note of these great things their parents don’t even know it happened. 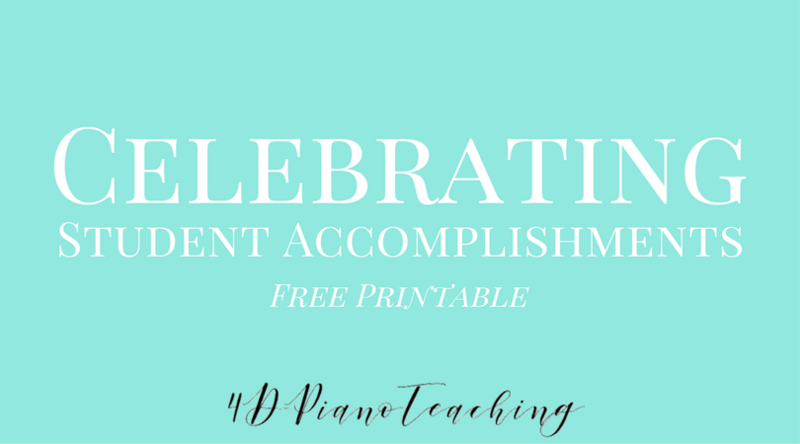 It’s so important to remember the positive accomplishments so we can emphasize these when we hit harder points in piano study! I’ve always wanted a quick way to keep track of student accomplishments and share this with parents. So I finally made a printable for this purpose. At the start of each year, I plan to print a copy of this page for each of my students. First I’ll write their name on the top and put them all in a binder. Then, I can have the binder open during their lesson time and as they accomplish something simply write it in one of the boxes. At the end of the year, or when the boxes are all full, I can give it to the parents so they have a record of what their child has learned that year. Today, I’ve created files in several different color schemes and also one in black and white. Click below to download and save. Enjoy!